Did you know that the average cost of an information breach can exceed over £2.4million in lost costumers, revenue, and fines? With this in mind, it’s incredibly important that you keep your business’ confidential information safe and secure, ensuring it doesn’t fall into the wrong hands. One of the best ways to do this is by document shredding. No matter what your business’ document disposal requirements, it’s important that you have a secure and thorough process in place to eliminate any risk of a privacy breach during the disposal of your documents. In this article, we’ll take an in-depth look at what document shredding is and what the process involves. We’ll then move on to looking at the prices of document shredding services, before examining the various different types of shredding services available, including mobile shredding services, self-service document shredding, and confidential shredding. All physical documents eventually outlive their useful purpose. And retaining documents for too long can put your business at risk of non-compliance with UK privacy and data protection regulations. With this in mind, it’s good practice to establish a process for the amount of time certain types of documents should be stored, taking into account legal requirements as well as the usefulness of the documents for the business. Once the relevant period of time has passed, you need to ensure that your documents are disposed of in a safe and secure way. Think about it, within your business, there are countless valuable documents – everything from business plans and forecasts, R&D research, and customer lists, through to customer lists, sales analysis, security patrol times, and rotas, could be of interest to competitors, journalists, and thieves. Unshredded paper documents left outside for collection by bin men can be stolen for identity theft, corporate fraud, or even industrial espionage purposes. This not only presents a significant business risk, but if you don’t shred sensitive personal data in accordance with a corporate shredding policy could be in breach of the Data Protection Act. You wouldn’t leave your office door unlocked or unalarmed, so why would you leave your sensitive data in harm’s way? Outsourcing your document shredding might seem like an additional cost to add to your list of outgoings, but it’s well worth the investment. Just think about how long it would take you to shred all of your confidential documents in-house, using a small office shredder. This is the precious business time that your staff could spend performing much more profitable, productive tasks. After all, time is money. 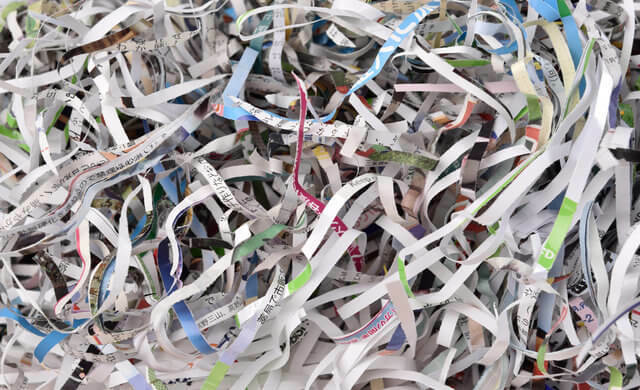 Once they have been shredded, your documents will be transported to a recycling facility in confetti-sized pieces, where they will be recycled and returned to the marketplace. There are a wide variety of different document shredding services available from a whole host of different providers. Whether you have a huge amount of confidential waste to dispose of our just a handful of documents, the majority of shredding service providers will be able to accommodate your needs and provide a service that is both cost-effective and efficient. The amount of documents that a business has to shred will depend upon the size and type of business. There are usually discounts available for high volume shredding. Document shredding prices are usually priced at £ per kg rates, with the material being weighed either on or off site so you know exactly how many kilos have been shredded. An invoice is then provided based on that amount. Some companies will base the cost of their shredding service on their own scale. The table below, for example, uses black bin-liners as the metric. The price you pay per bag will depend on the overall volume of shredding required. Other companies may charge per minute, however, this can be inefficient as it means that the slower the shredding is done, the more it will cost. Many document shredding companies also take care of the destruction of a variety of other confidential materials, including electronic media, computer equipment, and more. Whilst some shredding services will visit your business premises and take your waste away to be disposed of at their shredding facility, mobile shredding services will bring their secure document shredders to you. This will allow you to witness the shredding yourself, so you can be totally assured that your documents have been disposed of according to your requirements. Whatever the size of your organisation, your mobile shredding service provider will collect your confidential documents and load them directly into their mobile shredder. This means that your company’s sensitive data never falls into unauthorised hands, for any reason. Many mobile shredding service providers will take care of the entire process for you, from the initial consultation and the supply of secure containers for your premises, through to the collection and the final destruction or recycling of your documents. Dispose of your sensitive data in a lockable bin, container, or bag (this is often provided by your chosen shredding company). Your chosen mobile shredding service provider will send a security-vetted and approved member of staff out to your premises in their secure, high-performance mobile shredding van. Your confidential waste will be transferred onto the vehicle and shredded on board whilst you wait. You’ll be issued a Certificate of Destruction confirming the safe destruction of your data in compliance with EU standards. You shredded documents will then be baled and sent to recycling centres to be reused or, where recycling isn’t possible, to incinerators. Mobile shredding allows you to enjoy the reassurance of secure document disposal, on-site, whenever and wherever you need it. And, because the shedder comes to you, you’ll be able to watch the documents being shredded before your very eyes. With mobile shredding, you won’t have to worry about your waste getting to its destination without incident as it will be shredded before it even leaves your premises. Self-service shredding may seem like a cost-saving option, though generally is not. For most businesses, and in particular, for small businesses, using resources to shred documents is not likely to be an effective choice. There are various things to consider – if you are using your own staff, then you are wasting time that they would otherwise be spending on their normal role. You will also need to consider the cost and process of disposing of the waste created in the shredding process. You will also need to consider the cost of the shredding machine itself; you could buy a cheap one, but may not find it to be as effective or safe as you need. Indeed, if you are shredding for confidentiality reasons, then you should not rely on a cheaper machine to save money. Self-service can sometimes be a good option; however, for peace of mind and security, it is generally far better to rely on the services of professionals. If you work with documents that contain the personal information of individuals, you have a legal obligation to protect their information under the Data Protection Act 1988. When disposing of these documents, they must be treated as confidential waste and handled carefully to ensure that you’re fully compliant with the law. This means that confidential documents can’t simply be torn up and disposed of with other, non-sensitive paper waste. Confidential shredding is the most secure way of getting rid of your confidential waste and ensuring that your customers’ or clients’ data remains completely secure. Not disposing of your sensitive documents in a confidential manner can be in breach of the Data Protection Act. This can lead to fines of up to £500,000 for your company. What’s more, if your sensitive client information ends up in the wrong hands, it can lead to legal action, the loss of customers, and damaged public relations. State-of-the-art cross cut shredders use cross-cut shredding technology in order to break your confidential documents down into confetti-sized pieces so that they can never be reconstructed, despite the most committed efforts. 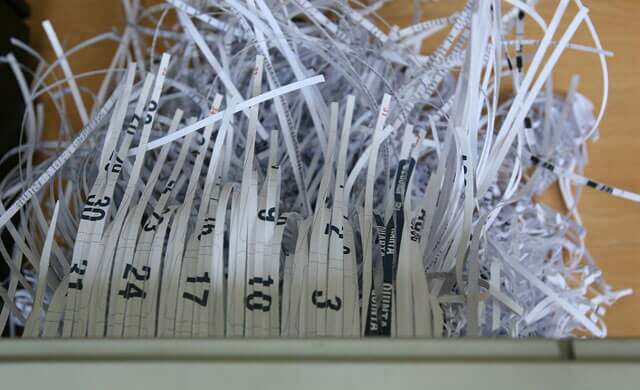 Confidential shredding services should also provide a Certificate of Destruction to confirm that your material has been securely and confidentially destroyed. This not only provides peace of mind, but it also acts as proof that your data is no longer at risk and your business is fully compliant with the relevant data protection laws. The information on this page should help you to understand what sort of process you need to go through in order to shred documents. The details and prices available though are guidelines, and so may not be entirely relevant to your business. To get the most relevant information possible, you should speak to suppliers – Startups can help you with this. To compare quotes and to get information directly from top UK document shredding companies, you simply need to complete the form at the top of this page. We can then use your details and specifications to put you in touch with the best supplier possible. The document shredding comparison process is free, quick and easy, and it could save your business both time and money.